Stoneclough is a suburban area of Kearsley in the Metropolitan Borough of Bolton, Greater Manchester, England. It is located 3.7 miles (6 km) south-east of Bolton, 4 miles (6 km) south-west of Bury and 7.9 miles (13 km) north-west of Manchester. It is located on the banks of the River Irwell to the southeast of Bolton. Historically part of Lancashire, there are a number of listed buildings and recognised ancient monuments in the villages including Ringley Old Bridge, the village stocks, Kearsley Mill, St Saviour's Church and clock tower and the large stone railway bridge on the Manchester to Bolton railway line. The disused Manchester, Bolton and Bury Canal also passes through this area. Stoneclough is mostly residential, housing has replaced most of the old industry. These industrial sites included the Kearsley Paper Works owned by Robert Fletcher and Sons and Kearsley Power Station located on Hulme Road. These have been demolished. The Stoneclough means stony ravine from the Old English words stan meaning stony and cloh meaning a ravine. Lying within the boundaries of Lancashire since the 12th century, Stoneclough was a small settlement in the township of Kearsley in the civil and ecclesiastical parish of Deane in the Salford Hundred. Stoneclough became part of the Kearsley Local Government District in 1865, and then part of Kearsley Urban District in 1895. 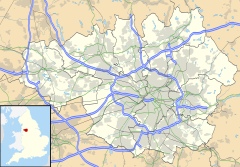 Under the Local Government Act 1972, Kearsley Urban District was abolished in 1974 and its former area, including Stoneclough, became an unparished area of the Metropolitan Borough of Bolton in Greater Manchester. Stoneclough is now part of the Kearsley ward, one of Bolton Council's twenty electoral wards, and is represented by three councillors: Derek Burrows (Lab) since 2006, Liam Irving (Lab) since 2011, and Mark Cunningham (UKIP) since 2016. Stoneclough is also part of the Bolton South East constituency and has been represented in the House of Commons by the Labour Party MP Yasmin Qureshi since 2010. The Parish of Stoneclough incorporates St. Saviour, Ringley with Holy Trinity, Prestolee. It is part of The Farnworth, Kearsley and Stoneclough Team Ministry. Ringley Stocks, in Ringley village. Pack horse bridge over the River Irwell. There are five public houses around Stoneclough, the Hare and Hounds, the Grapes and the Market Street Tavern are on Market Street. The Horseshoe (next to St Savior's Church) and La Roma Italian restaurant, formally The Lord Nelson, are either side of the river and are linked (to pedestrians) by Ringley Old Bridge. Stoneclough's football team plays in the West Lancashire Football League, its ground is next to the Hare and Hounds in the village. Last season[when?] the team managed jointly by Trevor Ball and Andy Tite won the West Lancashire first division title the first division cup and the West Lancashire team of the season, they also came runners up in the Bolton Hospital Cup to Ramsbottom United of the North West Counties League capping a very successful period in their history, this gained them promotion to the Premier Division and also in their short time in the West Lancashire League they have won the second division cup and the second division runners up title. Other notable achievements are winning the Bolton Combination Premier Division twice and the Premier Division Cup. The team is currently in the 2nd division in the West Lancashire League pushing for promotion to get back to former glory. There are two primary schools in the area, St. Saviour's, a Church of England primary school in Ringley and Prestolee County Primary School. The area is served by Kearsley railway station (formerly named Stoneclough railway station) which is on the Manchester to Preston Line (via Bolton) railway line. ^ "Greater Manchester Gazetteer". Greater Manchester County Record Office. Places names - S. Archived from the original on 18 July 2011. Retrieved 3 July 2008. ^ Billington, W.D. (1982). From Affetside to Yarrow. Egerton: Ross Anderson Publications. p. 77. ISBN 0-86360-003-4. ^ a b Farrer, William; Brownbill, J., eds. (1911). "Townships: of Kearsley". A History of the County of Lancaster. Victoria County History. Volume 5. British History Online. pp. 39–41. Retrieved 24 July 2016. ^ Links in a Chain Project. "Kearsley 1865–1974". Links in a Chain. Retrieved 24 July 2016. ^ "Elected Members". Bolton Council. Retrieved 1 August 2016. ^ Love 1839, p. 234. Love, Benjamin (1839). "Manchester as it is". N/A. Wikimedia Commons has media related to Stoneclough.